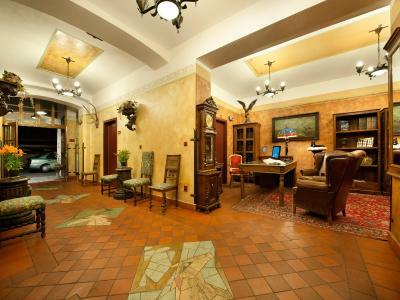 Lock in a great price for EA Hotel Jeleni Dvur Prague Castle – rated 8.6 by recent guests! 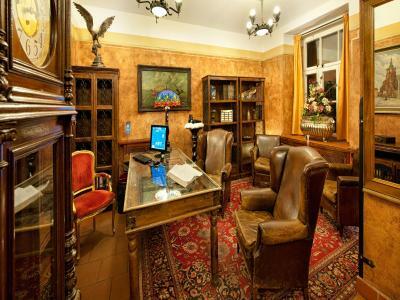 This hotel is a very cozy and most charming place to stay in Prague. The rooms are very comfortable, warm and the breakfast is simply amazing. The staff is nice and helpful. 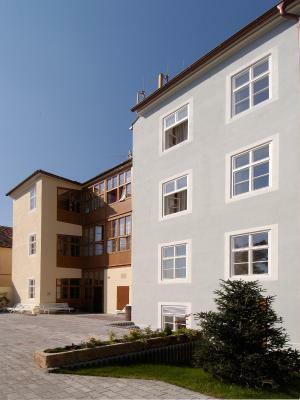 The property is situated in a pleasant neighborhood, close to Prague Castle and the Loretta Monastery. The city center is easily reachable by tram or foot if you enjoy walking. It takes almost one hour to get to the airport. It is the second time that I book a room in this hotel and I would stay here again any time. I highly recommend it. Breakfast was excellent. Only in Braunschweig Mercur Hotel I had better breakfast. The location was excellent, and the staff was friendly, we received hot water for tea in each evening and they charged no fee for it. This is a reasonable mid-range hotel at a good price point considering it is Prague and I scheduled at the last minute. 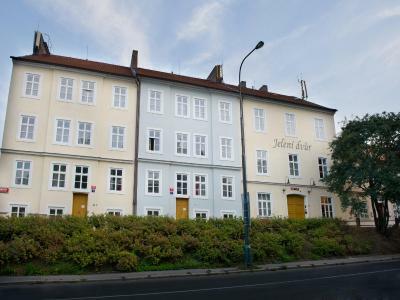 It is easily accessible by Tram 22, which connects to the Metro at Malostranska, and so you can get aroud town efficiently without a car. If you are headed for the Castle and environs, it is hard to beat for price and comfort - it is short walk to the Castle Square. The breakfast buffet is noteworthy, and the staff is friendly. The interior is quite newly done and very clean. 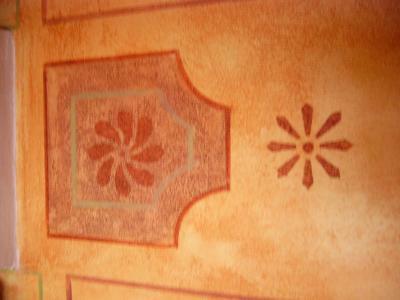 Helpful and nice staff, Excellent location near the old town and public transportation, good breakfast and clean rooms. The room was spacious and breakfast was superb for the price we paid. It is in a great location. We enjoyed walks over to the castle complex and within a 10 min walk there are 50 restaurants to choose from. We really liked everything about this place. The rooms were spacious and comfortable. Breakfast was good and staff helpful. The LOCATION was the best part! Tram 22 across the street gets you to Metro or middle of city. We could walk to the castle entrance, but we felt miles away from the hustle and bustle of downtown Prague. We loved the charming streets down the hill, and popped over to the Saturday farmer's market. Nice, clean rooms. Friendly and helpful staff. Excellent breakfast included with room. Right by a tram stop. Very reasonable price! Excellent value. Location is great, walking distance to the Prague Castle and further to the downtown. Transportation is excellent - tram stops in front of the hotel. Clean, comfortable room, excellent breakfast. Tram tickets can be purchased at the front desk. Has parking and enough of it. Friendly staff, speaks many languages. 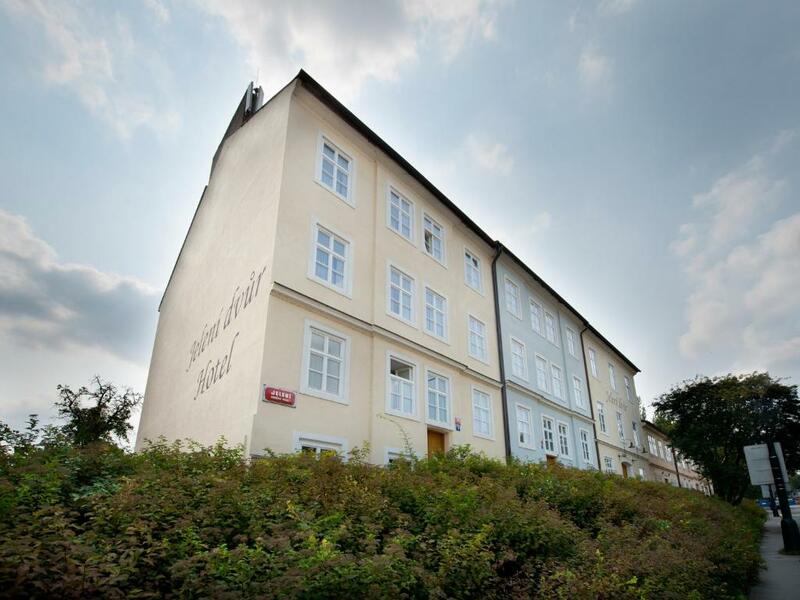 EA Hotel Jeleni Dvur Prague Castle This rating is a reflection of how the property compares to the industry standard when it comes to price, facilities and services available. It's based on a self-evaluation by the property. Use this rating to help choose your stay! 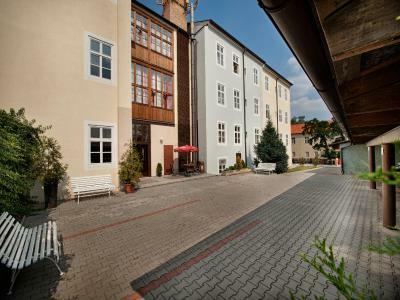 The Jeleni Dvur hotel with its pleasant family atmosphere is located at an enviable spot close to Prague Castle, only 15 minutes' walk from the city center. 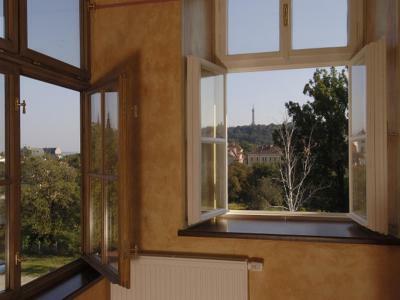 From some of the rooms you enjoy superb views over the charming Mala Strana quarter. The Jeleni Dvur hotel has its own parking and offers easy access to the city center and the Václav Havel Airport. When would you like to stay at EA Hotel Jeleni Dvur Prague Castle? Room with satellite TV and a minibar. Private parking is available on site (reservation is needed) and costs EUR 16 per day. Suite with a sitting area, offering satellite TV and a minibar. Room with a castle view, offering satellite TV and a minibar. Airy rooms with stylish furniture and original decorations adorning the hallways and stairways of the hotel, non-stop retail sales of goods and drinks at the reception, an outdoor seating area. 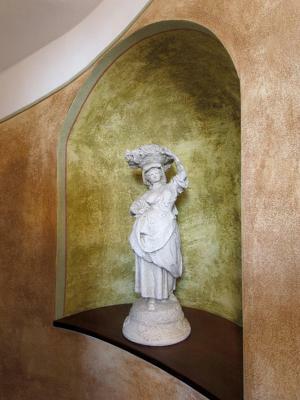 House Rules EA Hotel Jeleni Dvur Prague Castle takes special requests – add in the next step! EA Hotel Jeleni Dvur Prague Castle accepts these cards and reserves the right to temporarily hold an amount prior to arrival. For nonrefundable bookings, guests are required to use the same credit card used for the booking. Otherwise booking can not be guaranteed. Please contact property for more information. Contact details can be found on the booking confirmation. Elevator is noisy, you could hear lot of banging noise when it works (on last floor). Excellent location just above the castle area, 20 min walk to City center downhill (not so easy when you walk back to hotel), big parking lot, excellent wifi. Very good value for money. 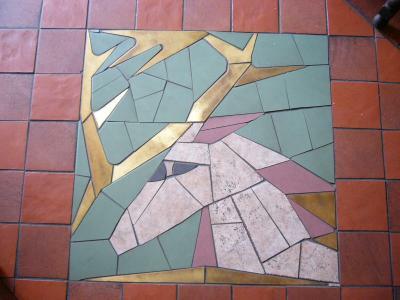 - it's right in front of the tram station , very close to the castle. On doubleroom we got was to small for 2 Person. Not really a double room. Breakfast was OK. Location of the Hotel was OK. Staff was OK. The breakfast was really good with plenty of options, on check in the receptionist was very helpful and the hotel is quite quirky close to the Prague Castle and tram stop out the front. When we arrived, windows were open & heating was set to 0. So took some time to get room warm before going to bed. Nice hotel, fair price, breakfast was good, reception is antique, good looking. 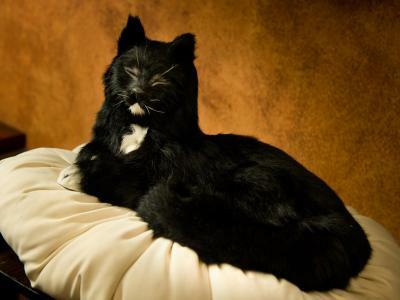 I requested in booking a queen bed, but I didn't get one. The towels was too used(there were holes in it). We were charged twice for the accommodation and I ended up with no money for the last day. I got the refund automatically 3 days later, so at least I didn't had to run after my money. The bed is short for height 190cm. Coffee is not tasty. The room is quiet. Great parking. A larger bedroom without the double bed against the wall, but we had a good view of the castle which we wouldn't have got with a larger room. The breakfasts were fine with a good choice of food. The staff were friendly and helpful. Good transport links to city centre. 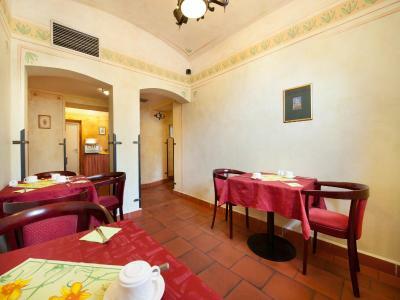 Within walking distance of Prague Castle and some good restaurants. Excellent variety and selection for breakfast. Close to rapid streetcar service to Central Prague. Nothing was bad enough to dislike. It is next to a tram line but sort of by itself, and somewhat isolated from the neighborhoods, but this is mostly a matter of taste. I took a room with a “Caste View”, and as I have been by the hotel numerous times I knew it was unlikely I could see the Castle from there. What it really means is that you have a pleasant view, instead of looking at a street with a tram going down the middle. What I could see from my window was the Loretta towers, and part of the Petryn Hill, which I found perfectly acceptable.